On September 6, 2018 the CBCI-OSC Chairman Bishop Most Rev. Salvadore Lobo along with the Member Bishops, Most Rev. Sebastian Kallupura and Most Rev. Anthony Poola, and the CBCI Secretary General Most Rev. Theodore Mascarenhas and Deputy Secretary General Rev. Fr. Jervis D’Souza and the Archbishop of New Delhi, Most Rev. Anil J.T. Couto, and Rev. Fr. J.A. Carvalho, SFX, and the CBCI-OSC Secretary Rev. Fr. 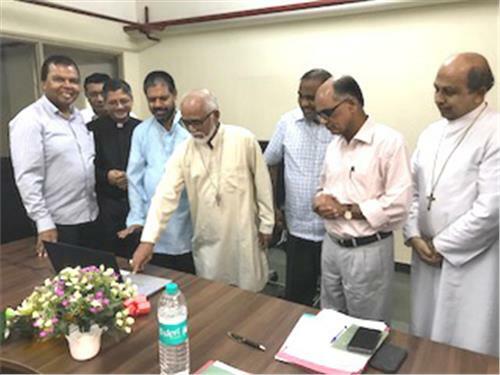 Varaprasad Marneni inaugurated the new CBCI-OSC Website. It is a dynamic website and it is accessible at www.cbciosc.com.